Just like the warm breeze of summer is destined to make way to chilly winds of fall, so too go the years of our lives, moving, what seems, ever-faster the older we get. And when it comes to watching our children grow, that train of time seems to forever be speeding faster and faster away down the tracks of life. We don’t tend to notice the day-to-day changes as they occur. Small increments of change are hard to pick out when you’re there along with it day in and day out. It’s the milestones, the transitions – those are the moments that really make us stop and take notice of how swiftly the sands fall through the hourglass. For me, one of those moments came today, as we finally transitioned our little man out of his crib and into a toddler bed. It was overdue, yes, but despite that, it didn’t make it any easier – at least not the emotions of mommy and daddy. A friend was getting rid of a toddler bed that their own children had outgrown and graciously passed it along to us. Meg sanded it down, painted it (with the little guy helping pick the color) and boom! We were ready to go. The excitement on his face was palpable, jumping up and down, grinning as Meg and I turned the Allen wrench, both assembling his new “big boy bed” and dismantling the crib that’s been his overnight home since the earliest weeks of his life and moving it out of the room and across the hall to our office – one more step of preparation for the arrival of baby number two in the months ahead. When the end of the night came, you would have thought it was Christmas morning. Instead of fighting the need to go upstairs and get into bed, he led the way, excitedly heading into his room and pulling out a book to read per our storytime routine. Only now, he didn’t want to go into “mommy and daddy’s bed” to read as has been the case every night these past three years. No, instead he insisted we read in his room, climbing into his bed and pulling over the covers as daddy reluctantly took a seat next to his bed, opened the book and began reading, while simultaneously hiding the feeling of melancholy at his claiming his own, independent life. A few precautions were taken. Our house has two floors, so we pulled out ye olde baby gate and placed it at the top to prevent any mid-night walking, falling and potential injury now that there’s easy access out of the room. Funny thing is, he never tried to climb out of his crib, something we consider ourselves incredibly grateful for. While the cats were initially puzzled at the presence of the gate on their nightly rushes up and down the stairs, it turned out to not be needed right away (though we’ll still keep it up at night regardless). We talked about staying in bed until mommy and daddy give him the clearance to do so and wouldn’t you know it, he listened. So well, in fact, that when his stuffed ladybug (from Eric Carle’s The Grouchy Ladybug) fell out of bed, he called out to have mommy come pick it up for him because he’s not supposed to get out of the bed. I’m proud of him. I’m happy for him. I love seeing him beam about the idea of going to bed or taking a nap because it means a “big boy bed.” But I can’t help but feel, as the cliché goes, that it’s all moving a bit too fast. I may never be okay with it. I’m sure these feelings will continue – the first bicycle ride, or a first day of school, first high school dance, or, perish the thought, move-in day at college. It’s overwhelming to think about. So, the best that I can do is just try my best to not brush off the requests to play, to read, and to be around. There will be plenty of time as he gets older he’s going to have his own life. 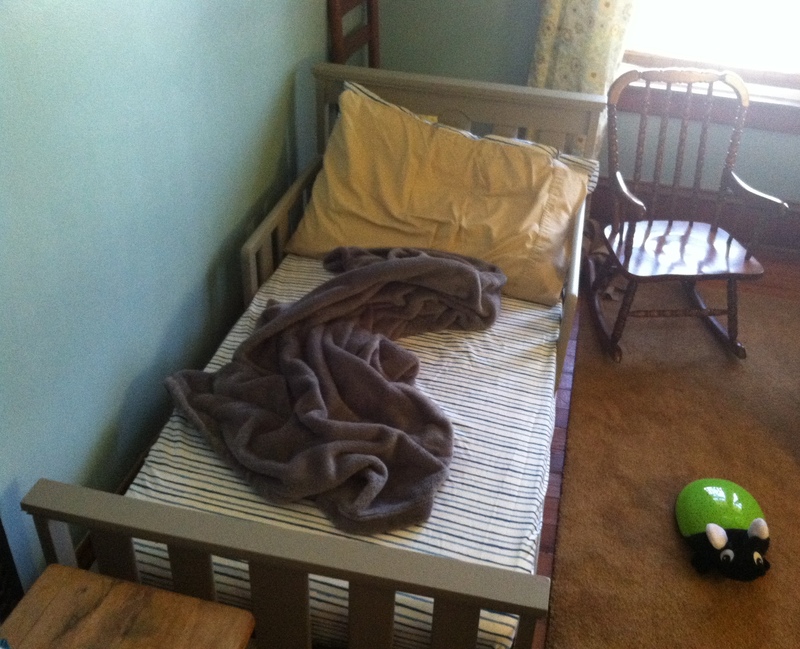 Moving to a big boy bed may just be a small sign of independence in the bigger scheme of things, but it’s enough for me to take notice, and to remind myself that we don’t get second chances at these things. Work will come and go. Books to read will sit on the shelves. Projects to create can always be created. But this…this opportunity to be with my little boy while he’s a little boy will only last so long. As painful as it can be during the transitions, it’s a reminder once again to cherish every single moment and not let the time slip by.